We’ve spent a fair bit of time with the Samsung Chromebook Pro and Plus both. In that time, one thing has become quite clear. Google Keep needs some work. Perhaps I should be more specific. Google Keep needs some real work when it comes to using a stylus. And I’m not just talking about pen accuracy. 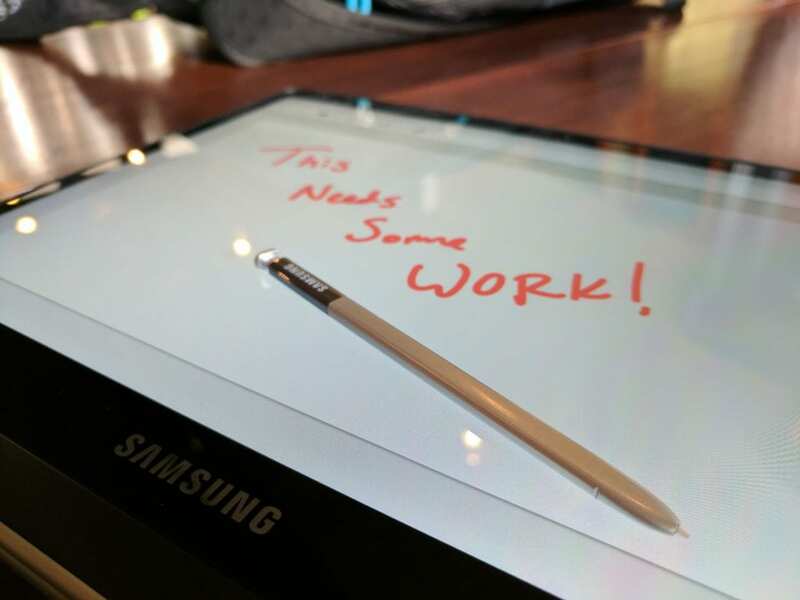 There are many ways that Keep, for now at least, is one of the worst showcases for how good this screen and pen combo actually is on the Samsung Chromebook Plus and Pro. Out of the gate, when the pen is removed from the Chromebook (which is such a great, under-appreciated feature), the ‘New Note’ option in the pop up menu leads you directly to Google Keep. Because of this default setup, it would seem to be the case that Keep is the best, most well-integrated app for taking said note. And, right now, it isn’t. And the first reason is pointer lag in the pen. Honestly, the on-screen record of where the tip of the pen travels is just fine, minus one really big issue we’ll hit in a second. Where you put the pen you get a mark. It does that part just fine. However, the lag that exists is simply not acceptable if you are really going to take notes here. When you can see up to a few millimeters of gap between your pen tip and the drawn line, it is off-putting. Especially if you are taking notes. Usually, when jotting notes, you are writing as feverishly fast as you possibly can in order to capture as much info as possible. This is where the lag issue becomes very, very apparent. And, perhaps some people don’t feel like I do about this, but I really have a hard time using an electronic note-taking device if the lag is this bad. No, that isn’t a typo. Google Keep, at the time of this article, cannot distinguish the pressure being applied by the pen. What it does, instead, is register the speed that you are moving the pen with and make the pen/marker/brush stroke thicker based on that. If you have a Samsung Chromebook Plus, try it real quick. Move the pen at the same speed while varying your pressure. You will see no change whatsoever. Now, with the same pressure, change from slow to fast with the pen movement. The line (assuming you are using one of the writing settings that allows for this) will get thicker as you move faster. This is inexcusable. If the software you are suggested to use as default when you get a pressure-sensitive stylus out of a device cannot detect pressure, this is a massive fail. And, as you will see in a second, it is not a hardware issue. This is on Google. Lastly, Google Keep is a note-keeping software. Tasks, lists, etc. are meant to be kept here for use later. If I’m in a meeting, conference or a class and need to jot out some notes for use later, there are a few things that help greatly: lines on the paper and portrait layout. First, lines. There is a reason ruled paper exists. It helps us organize on the fly and keep things somewhat clear as we are jotting our notes down. They are pretty important. In Keep, right now, there is no option whatsoever for ruled paper. Second, portrait orientation feels more natural here. On the Samsung Chromebook Plus, in portrait mode you are getting pretty close to a standard sheet of paper. When rotated this way, however, Google Keep hold you writing canvas in landscape mode and there is no option to make it fit in portrait. Instead, you have a virtual sheet of paper stuck in landscape with lots of empty space above and below you writing canvas. Now that I’ve got that out of my system, there is some really good news and I want everyone who uses a Chromebook with a stylus to know it! There are lots and lots of note-taking apps out there in the Play Store. I’d tell you to check out many of them to see what works best for you, but I’d also suggest starting with Squid. 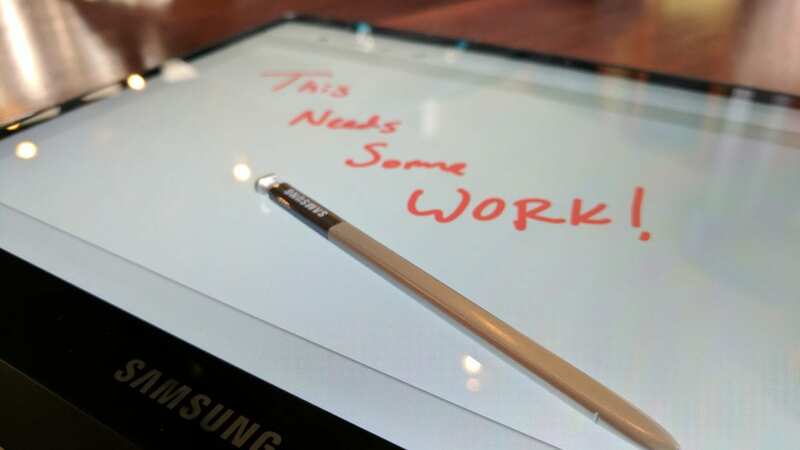 We plan on doing a quick video review of it, but for now I’ll just say this app is simply fantastic and it has renewed my hope that the Samsung Chromebook Plus can actually be used for note taking in real life. First, it totally solves almost every gripe I have with Keep. Pen lag is almost non-existent thanks to the app’s support of pressure-sensitive stylus. Second, it has true pressure sensitivity and it works wonderfully! I can’t explain how much better writing is with this app. Lastly, there are more types of paper to use than I know what to do with. Lined, graph, and even sports-related score keeping paper are on offer. The only issue is with Android apps in general. Many of them don’t scale properly when the screen is rotated. So, for now, taking notes with the Samsung in portrait mode is still a task left for a later date. This will likely be corrected with Android 7.1 when it finally comes out on Chromebooks in the near future. So, amidst the doom and gloom around Keep, there is much hope with this stylus. From what we can tell, many devices with the same stylus setup are coming, so that is very good news. What we hope to see is two-fold. Google needs to make Keep better. That much is clear. But, additionally, we need the ability to set a new default app for the pen shortcut in the tray. That could be a really, really simple fix until Keep is really ready for prime time.